Duke University MLK Commemoration Committee proudly presents the Durham Symphony, under the direction of Maestro William Henry Curry, 100 Men in Black, the Men’s Chorus from Shaw University, Keith Snipes, Yolanda Rabun and the John Brown ‘little’ Big Band, for a special concert honoring the life and legacy of Rev. 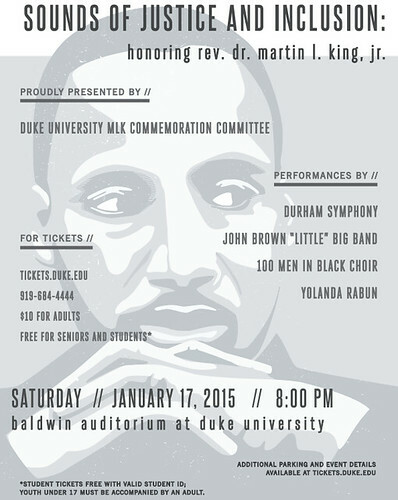 Dr. Martin Luther King, Jr. on Saturday, January 17, 2015, 8:00 PM, at Duke’s Baldwin Auditorium, Durham. The concert ”Sounds of Justice & Inclusion: Honoring Rev. Dr. Martin Luther King, Jr”, will include music by African-American composers “Duke” Ellington, Scott Joplin and William Henry Curry, jazz selections with the John Brown ‘little’ Big Band featuring Yolanda Rabun, and spirituals with the Men’s Chorus from Shaw University. 100 Men in Black will perform Lift Every Voice and Sing. The tribute to Dr. King will feature Maestro William Henry Curry’s Eulogy for a Dream, with narrator Keith Snipes and Morton Gould’s “Hymnal”, an orchestral piece based on the song “We Shall Overcome”. This year, the annual Martin Luther King Commemoration coincides with the kick-off of a year of programming in recognition of what would have been the 100th birthday of Dr. John Hope Franklin, a beloved member of the Duke community and one of America’s foremost historians of Black life. The concert tribute to Dr. Franklin will include comments by William Henry Curry and Keith Snipes. The concert grand finale will be a performance of “The Battle Hymn of the Republic” with all performers. Tickets are available through the Duke University Box Office, https://tickets.duke.edu or 919-684-4444. Tickets are $10 for adults and free for Seniors 65+. Students can acquire a ticket at no cost with a valid student ID. Youth under 17 must be accompanied by an adult. Sponsorship for the concert is provided by Duke University MLK Commemoration Committee, Duke Chapel, and the Duke University Office of the Vice Provost for the Arts. Baldwin Auditorium is located on Duke’s East Campus at 1336 Campus Drive, at the intersection of Onslow Street and West Markham Avenue. For more information, visit the Durham Symphony web site at www.durhamsymphony.org or call 919-491-6576. Incorporated as a not-for profit organization in 1977, the Durham Symphony began as an all-volunteer community orchestra, offering free concerts. Today, under the direction of Maestro William Henry Curry, Resident Conductor of the North Carolina Symphony, the Durham Symphony has evolved into a semi-professional orchestra composed of classically trained volunteers and professionals. Enhancing Durham’s rich cultural heritage, the Durham Symphony performs high quality orchestral concerts that foster accessibility and encourage the development of music appreciation and education. The Durham Symphony’s programming reflects a commitment to familiar, American, and popular music.